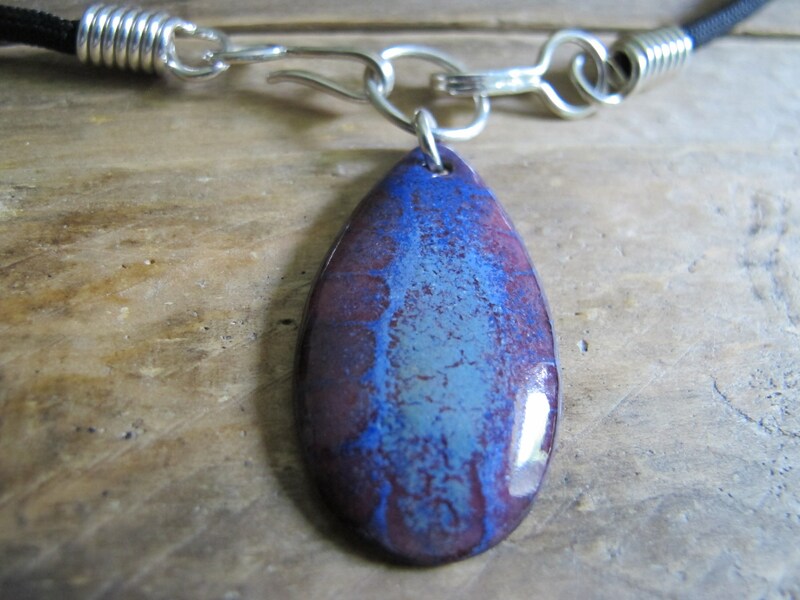 This slightly domed pendant was made with powdered vitreous(glass) enamels, which were torch fired on to pure Copper in iris, deep purple and blue. The black Nylon 4mm cord with Sterling Silver end caps and hooks measure 15-3/4 inches long. I've made the pendant and Sterling silver findings( end caps, hooks and rings) myself. It all hangs from a black braided nylon cord and attaches in the front for comfort and convenience. It unhooks on both sides and is interchangeable with the other similar necklaces that I make. Torch firing with enamels may give the back an abstract mottled appearance.